For use in any outdoor fogger. 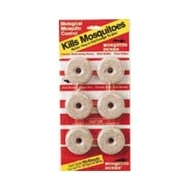 Kills mosquitoes, gnats, flies, and other insects on contact. Ready to use, no mixing required. Fog dissipates quickly and provides hours of mosquito-free enjoyment. 1/2 gallons covers 5,800 square feet. A biological mosquito control for standing water. Controls mosquito larvae before they can bite. .2 oz. pouch covers 50 sq. ft. and lasts for 2 weeks. 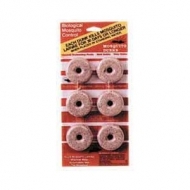 Use in water gardens, bird baths, unused swimming pools and any other location around the home where water can collect and remain for extended periods. Will not harm fish, amphibians and other aquatic animals. Contains Geranium Oil, Cedar Oil, Lemon Grass Oil, Garlic and Citronella Oil. Effectively repels for up to 3 weeks. Non - toxic, biodegradable and pleasantly scented. Easy to use shaker applicators. Enjoy mosquito free surroundings, any place, anytime. 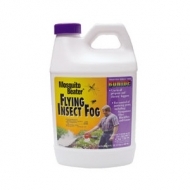 Use around homes, lawns, pool and patio areas, water gardens, tennis courts, picnics and campsites. It is an ideal product to be applied before outdoor weddings, pool and patio parties, around schools and cookouts. 2.5 percent; Kills and repels mosquitoes, flies, gnats. 1qt. protects 5000 sq. ft. Simply attach to garden hose and apply. 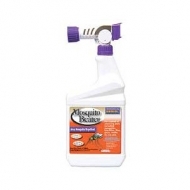 Low odor, water based Permethrin. Mosquito Dunks kill mosquitoes before they are old enough to bite. Long term biological larvicide keeps working for 30 days and more. Simply place in standing water including flower pots, clogged gutters, water gardens, bird baths and animal watering troughs. 100 percent biodegradable. Used by professionals for more that a decade, Mosquito Dunks have proven their value in destroying Mosquitoes - by killing the larvae before they mature into biting adult pests. Place Mosquito Dunks in ponds or standing water and it&#39;s active ingredient, BTI, kills mosquito and black fly larvae for 30 days or more. While floating, they slowly release a long term biological mosquito larvacide killing the larvae before they hatch into adults. Will not effect fish, plants, people or wildlife. Alternative wetting and drying will not reduce it&#39;s effectiveness. Use one dunk per 100 sq. ft. of water surface. For use with most Blue Rhino SkeeterVac Traps. 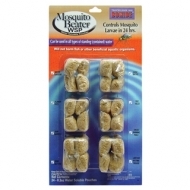 Attracts certain mosquitoes and other biting flies. Restricted from sale in the following states: AL, FL, KY, and LA. For use with most Blue Rhino SkeeterVac Traps. Unique glue traps biting insects but won't stick to you.